Our first ‘big’ event of the year is just over a week away while i write these notes. We are looking forward to returning to the Practical Classics Classic Car and Restoration Show for a third year. There has been a lot of local interest in our cars in previous years from people who either worked at Longbridge or who had owned a ZED at some time. This makes an ideal location to officially launch and promote our ‘Save our ZED’s’ campaign. The following Saturday 30th March, we head for Silverstone for the first racing round of the new year. After a close finish in the Trophy Championship at Snetterton last year, how will this season begin? It’s looking to be another large grid of ZRs this year. Further ZED action can be seen in the Cockshoot Cup and Peter Best Insurance Challenge. We will be organising the lunchtime parade laps as usual -so please find Geoff to sign on for this unique opportunity to view the track from the drivers-eye view. Please bring your membership cards with you as membership numbers will be recorded on the forms. There will be a full account of both these events in the next update. Later this month we return to Birmingham for the annual Pride of Longbridge gathering on Saturday 13th April. There has been a lot of interest in this event on social media over the last couple of months and the turn-out is expected to be massive again. Bearing that in mind we advise arriving early as there will be a queue to get in. We will be sharing an area with the main club where we aim to have our Campaign Car and ZR Express Van on display. Our new feather-flags are huge so hopefully we will be easy to spot on the field. At the end of the month we return to Brands Hatch racing circuit in Kent for a full weekend of racing action. 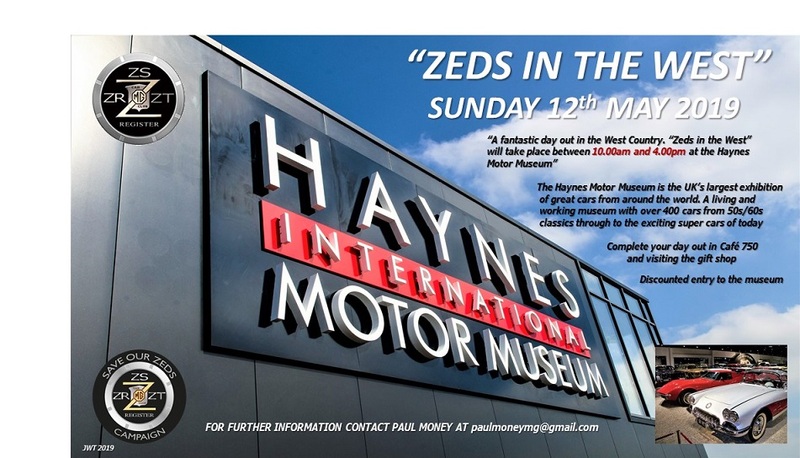 Mention should also be made to our upcoming regional event, ‘ZEDs in the West’ which is taking place at the Haynes Motor Museum in Somerset on Sunday 12th May. Please see the advert for this event elsewhere in Safety Fast! For further information visit our website or facebook page. If you have recently joined the Register or have changed your ZED over the winter then please contact our Registrar Paul Money at the following: paulmoneymg@gmail.com. We are currently in the process of updating our database. We’d also like to welcome all the new members who have joined us recently. We also have the build-data for the entire run of ZEDs. If you would like to know more about your ZED, then contact myself or Paul. Please use your membership number in all correspondence.